In many cases, flotation is a highly effective mineral recovery unit operation. Even if a mill process is running well, issues encountered with mineral liberation, bulk water and particle surface chemistries and non-optimum particle sizes often reduce recoveries below potential and make achievement of saleable concentrate grades difficult. Particle sizes are a very important consideration when outside the typical 37-200 µ size range which generally is hydrodynamics driven. Equipment and reagent suppliers have been working hard to improve the flotation of fines and coarse particles and have advanced understanding of the problems as well as potential and actual solutions. On the equipment side, conventional equipment have been optimized with power efficiency and hydrodynamic conditions the primary thrusts. Innovative equipment solutions have been developed for fines recovery but particularly coarse. Some of the recent coarse flotation advances offer considerable economic promise with some that can be considered pre-concentration steps. Reagents drive particle-bubble hydrodynamics and attachment. Flotation collectors make the particle surfaces hydrophobic and through the powerful hydrophobic attraction forces drive particle attachment to bubbles. The key is identifying the optimum collector chemistry and combinations that optimize recoveries in face of the challenges posed by increasingly variable and altered ores being mined. Frothers are a key part of any flotation reagent program which drive hydrodynamics and thus kinetics. 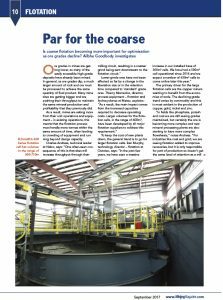 Bill Hancock was recently interviewed along with several other equipment and reagent global experts by Mining Magazine on developments and challenges posed by coarse particle flotation. This September 2017 article is a good review of the present state of art by the industry’s thought leaders. This article is attached for your benefit.